Come experience pole vaulting for the first time, or hone your existing skills. The emphasis of the program is to work with each vaulter, from beginner to advanced, to reach their maximum potential while having lots of fun. Poles are provided, or you're welcome to bring your own. All ages 9 and up (including adults) are welcome. Our 3-session Introduction to Pole Vault camp for boys and girls in grades 4-8 will be held on Sunday April 28, Saturday May 11 and Saturday May 18 from 11:00 - 1:00. This is a fun clinic that will introduce young athletes to pole vault. Topics covered include: equipment, safety, pole carry, run/approach, plant and swing up. Sessions will be held indoors at Forest Lake Area High School (weather permitting, some sessions may be moved outdoors). Register by April 14 through Forest Lake Community Education here. We'll have 3 options for summer camps, each limited to a maximum of 10 vaulters so we can maintain a 1 to 5 coach to vaulter ratio. First time or experienced athletes, ages 9 to adult, are welcome. Register through Forest Lake Community Education here. • Sunday Afternoons June 2 - August 18, 3:00 - 5:30 PM. No session June 30; rain makeup if needed August 25. • Thursday Evenings June 6 - August 22, 5:00 - 7:30 PM. No session July 4; rain makeup if needed August 29. • Tuesday and Thursday Mornings June 11 - July 25, 10:30 AM - 12:30 PM. No session July 4. Details of our September-October fall sessions will be posted when finalized. Mike S., Mike H., Matt, Marty and Ryan B. You can download G-Force's 2019 schedule and rates here. 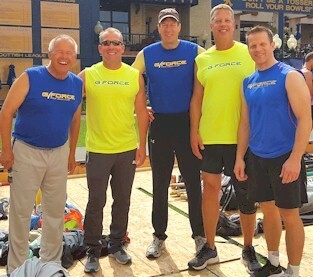 G-Force is run through Forest Lake Community Education. You can register online for the spring session here or summer sessions here. All participants will also need to provide a completed 2019 G-Force Membership Packet in order to participate. If you have issues with the online registration process, please contact us.